Powering billions of connected devices has been recognized as one of the biggest hurdles in the development of Internet of Things (IoT). With such a volume of tiny and ubiquitous smart physical objects in this new Internet paradigm, power cables or sizable battery packs are no longer a viable option to bring them online for years and decades. Energy harvesting, which enables devices to be self-sustaining, has been deemed a prominent solution to these constraints. 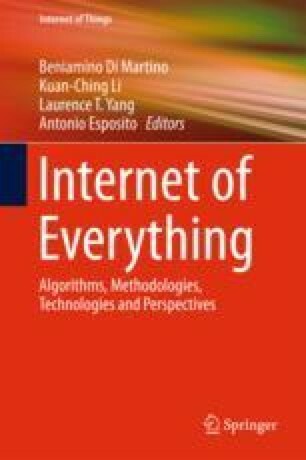 This chapter provides a comprehensive review of IoT devices, from their roles and responsibilities, to the challenges of operating them autonomously in heterogeneous environments. The concepts, principles and design considerations for energy harvesting are introduced to aid researchers and practitioners to incorporate this key technology into their next applications. Ashton, K. 2009. That ‘Internet of Things’ thing. http://www.rfidjournal.com/articles/view?4986. Accessed 9 Nov 2016. Atmel Corporation. 2015. ATA8520D [datasheet]. http://www.atmel.com/Images/Atmel-9390-Smart-RF-ATA8520D_Datasheet.pdf. Accessed 30 Nov 2016. Atmel Corporation. 2016. SAMB11 ultra low power BLE 4.1 SoC [datasheet]. http://www.atmel.com/Images/Atmel-42426-SmartConnect-SAMB11-SOC_Datasheet.pdf. Accessed 30 Nov 2016. Atmel Corporation. 2016. SMART SAM R21 [datasheet]. http://www.atmel.com/Images/Atmel-42223. Accessed 30 Nov 2016. Bormann, C., M. Ersue., and A. Keranen. 2014. RFC 7228 - terminology for constrained-node networks. Internet Engineering Task Force. https://tools.ietf.org/html/rfc7228. Accessed 14 Nov 2016. Brad, S. 2016. Greener datacenters for a brighter future: Microsoft’s commitment to renewable energy. https://blogs.microsoft.com/on-the-issues/2016/05/19/greener-datacenters-brighter-future-microsofts-commitment-renewable-energy/. Accessed 19 Nov 2016. Brill, J. 2015. How does the Amazon Dash Button work? http://www.forbes.com/sites/quora/2015/04/01/how-does-the-amazon-dash-button-work/#1d5b4f820280. Accessed 20 Nov 2016. Buyya, R., A. Beloglazov, and J. Abawajy. 2010. Energy-efficient management of data center resources for cloud computing: A vision, architectural elements, and open challenges. arXiv:1006.0308. Accessed 20 Nov 2016. Contiki. 2016. Contiki: The open source operating system for the Internet of Things. http://www.contiki-os.org. Accessed 19 Nov 2016. European Technology Platform on Smart Systems Integration. 2008. Internet of Things in 2020: A roadmap for the future. http://www.smart-systems-integration.org/public/documents/publications/Internet-of-Things_in_2020_EC-EPoSS_Workshop_Report_2008_v3.pdf. Accessed 3 Oct 2016. Ericsson. 2016. Cellular networks for massive IoT. https://www.ericsson.com/res/docs/whitepapers/wp_iot.pdf. Accessed 3 Dec 2016. Espressif Systems. 2016. ESP32 datasheet. https://espressif.com/sites/default/files/documentation/esp32_datasheet_en.pdf. Accessed 30 Nov 2016. Evans, D. 2012. The Internet of Everything - how more relevant and valuable connections will change the world. https://newsroom.cisco.com/video-content?type=webcontent&articleId=1111241. Accessed 9 Nov 2016. Heidt, H., J. Puig-Suari, A. Moore, et al. 2000. CubeSat: A new generation of picosatellite for education and industry low-cost space experimentation. http://digitalcommons.usu.edu/smallsat/2000/All2000/32/. Accessed 19 Nov 2016. Iridium Communications Inc. 2016. Iridium 9603 transceiver. https://www.iridium.com/Products/Details/Iridium-9603?section=tech. Accessed 20 Nov 2016. McMahon, MM., and R. Rathburn. 2005. Measuring latency in Iridium satellite constellation data services. http://dodccrp.org/events/10th_ICCRTS/CD/papers/233.pdf. Accessed 4 Dec 2016. Moschitta A., and I. Neri. 2014. Power consumption assessment in wireless sensor networks. http://www.intechopen.com/books/ict-energy-concepts-towards-zero-power-information-and-communication-technology/power-consumption-assessment-in-wireless-sensor-networks. Accessed 19 Nov 2016. Mosher, D. 2016. SpaceX just asked the FCC to launch 4,425 satellites. Business Insider. http://www.businessinsider.com/spacex-internet-satellite-constellation-2016-11. Accessed 4 Dec 2016. Nokia. 2016. LTE evolution for IoT connectivity white paper. http://info.networks.nokia.com/LTE-M-Optimizing-LTE-for-the-Internet-of-Things-LP.html. Accessed 4 Dec 2016. Nordic Semiconductor. 2014. nRF51822 product specification v3.3. http://infocenter.nordicsemi.com/pdf/nRF51822_PS_v3.3.pdf. Accessed 30 Nov 2016. Porter, M.E., and J.E., Heppelmann. 2014. How smart, connected products are transforming competition. Harvard Business Review. https://hbr.org/2014/11/how-smart-connected-products-are-transforming-competition. Accessed 9 Nov 2016. Raza, U., P. Kulkarni, and M. Sooriyabandara. 2016 Low power wide area networks: A survey. arXiv:1606.07360. Accessed 19 Nov 2016. RIOT. 2016. RIOT–the friendly operating system for the Internet of Things. https://riot-os.org. Accessed 19 Nov 2016. Semtech Corporation. 2015. SX1272 datasheet. http://www.semtech.com/images/datasheet/sx1272.pdf. Accessed 30 Nov 2016. Silicon Laboratories. 2013. EM351/EM357 high-performance, integrated ZigBee/802.15.4 system-on-chip. http://www.silabs.com/Support%20Documents/TechnicalDocs/EM35x.pdf. Accessed 30 Nov 2016. Texas Instruments. 2015. bq25570 nano power boost charger and buck converter for energy harvester powered applications (rev. E). http://www.ti.com/lit/ds/symlink/bq25570.pdf. Accessed 5 Dec 2016. Texas Instruments. 2015. CC3200 SimpleLink Wi-Fi and Internet-of-Things solution, a single-chip wireless MCU (rev. F). http://www.ti.com/lit/ds/symlink/cc3200.pdf. Accessed 30 Nov 2016. Texas Instruments. 2016. CC2630 SimpleLink 6LoWPAN, ZigBee wireless MCU (rev. B). http://www.ti.com/lit/ds/symlink/cc2630.pdf. Accessed 30 Nov 2016. Texas Instruments. 2016. CC2640 SimpleLink Bluetooth wireless MCU (rev. B). http://www.ti.com/lit/ds/symlink/cc2640.pdf. Accessed 30 Nov 2016. Ulmer, C., S. Yalamanchili and L. Alkalai. 2003. Wireless distributed sensor networks for in-situ exploration of Mars. http://citeseerx.ist.psu.edu/viewdoc/download?doi=10.1.1.116.324&rep=rep1&type=pdf. Accessed 7 Dec 2016.
u-blox. 2016. SARA-U2 series - data sheet. https://www.u-blox.com/sites/default/files/SARA-U2_DataSheet_(UBX-13005287).pdf. Accessed 30 Nov 2016.
u-blox. 2016. TOBY-L1 series - data sheet. https://www.u-blox.com/sites/default/files/products/documents/TOBY-L1_DataSheet_(UBX-13000868).pdf. Accessed 30 Nov 2016. Van Son, V. 2013. Bringing new wind to Iowa. http://newsroom.fb.com/news/2013/11/bringing-new-wind-to-iowa/. Accessed 20 Nov 2016. Wang, Y.-P., X., Lin, A. Adhikary, et al. 2016. A primer on 3GPP Narrowband Internet of Things (NB-IoT). arXiv:1606.04171. Accessed 20 Nov 2016.